Keynsham Bowling Club was formed in 1957 and has bowled in the Memorial Park ever since, as tenants of a succession of Local Authorities in whom the ownership of the park has rested. The Memorial Park has rightly been claimed to be the jewel in Keynsham's crown and we are proud to have enhanced it for over 50 years, as the Club and its facilities have developed. That development is far from complete and we are constantly reviewing plans to improve our facilities. As things stand now, we would start any comment on our facilities with the claim that we have the benefit of playing on one of the very best greens in the South West and add that it compares very favourably with the best in any other region as well. Our clubhouse provides comfortable 'Apres bowl' facilities, including the all important bar. The large picture windows afford a perfect view of the green. Our changing facilities are not huge but they are comfortable and well kept. Improvements in our changing rooms were top of the agenda within our Development Plan and we now provide four changing rooms; separate men's and ladies' changing rooms for both home and away teams. Both ladies and men compete as club teams in a variety of County and National Cup Competitions and individual Club Members are encouraged to enter both County and National Competitions as singles, pairs (including mixed pairs), triples and fours. Keynsham Bowling Club also runs no less than seventeen different internal competitions, including one just for novices. The knock-out competitions include five for ladies, seven for men, one mixed and one open. Competitions in league format include two for mixed teams and one for men only. We re-introduced) our Junior trophy in 2008 and hope this will now be an annual feature. On top of all that there is a full programme of friendly fixtures for both men's and ladies' teams, with the ever popular mixed friendly matches on Sunday afternoons and the equally popular Club Night on Monday evenings (that's just a friendly social roll-up). No season would be complete without our 'fun' days; usually Sunday afternoons, when we adopt fancy dress or bowl some unusual formats and always conclude with a Barbeque or a Fish & Chip Supper. Novice bowlers are encouraged to participate in friendly matches as soon as possible, with a view to progressing to league bowling when they are confident to do so. Keynsham Bowling Club is able to offer the services of at least six qualified coaches from amongst the membership to assist novices and experienced bowlers alike. Coaching sessions are usually held on Monday mornings and/or evenings, but other arrangements can be made for those with work, school or carers commitments. At least a couple of dozen of our men escape the leash to tour in the UK in September. The men's tours are for five days, with five matches and have ranged as far afield as Cumbria (sneaking in a match over the border in Dumfries), York, the Isle of Wight, Devon, the Midlands and Wales. Whilst we are essentially a bowling club we do manage to include an active social programme. Indeed, a very good way to meet us is at our regular coffee mornings; the first Wednesday of every month, right through the year, from 10.30am, in the Clubhouse. Whatever your bowling ability or bowling aspirations, you can be guaranteed a very warm welcome here at Keynsham Bowling Club. Membership application forms can be obtained at the Clubhouse or from our Club Secretary (return to our contact page for contact details). New Members are always welcome and that includes social members. Now there's a real bargain, a Social Membership is just £10 per annum and that gives entitlement to use all of the Club's facilities, except the green, and participation in all Club events, again, except on the green. 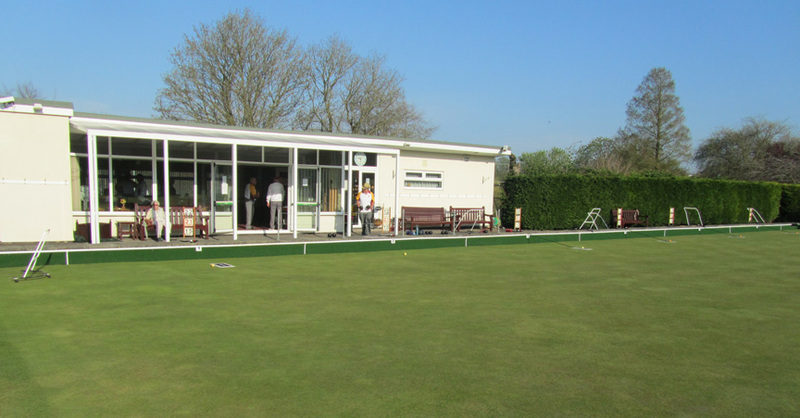 Keynsham Bowling Club is a Community Amateur Sports Club and in addition to employing the services of a professional green keeper (John Swift) the Club is serviced and maintained by Member volunteers. No offers of help from within or outside the Club will be turned away. The Club depends largely on Membership subscriptions for the income to maintain its facilities and has attracted some sponsorship to progress its Development Plan. We want this to be a Club the town of Keynsham and the local community can be truly proud of. If you can help us achieve that objective, please contact our Chairman or Club Secretary (see contact details). A visit to www.keynshamweb.org.uk or www.keynsham-tc.org.uk will give you an idea of what a busy little town Keynsham is. One of the underlying objectives of Keynsham Bowling Club is to be a contributor to this thriving community. As simple examples we would cite our participation in the Memorial Park Forum, right from its inception in 2007 and our efforts to involve local schools in bowling. For more practical details for “getting started”, please click on the “Getting Started” link. The final comment comes from our President, succinctly summing up the whole ethos of Keynsham Bowling Club:- "Enjoy, enjoy, enjoy!" Keynsham Bowling Club is an equal opportunities club. The 6 Golden Clarions or trumpets on a red background were the Coat of Arms of William, Earl of Gloucester. The Arms were later adopted in 1166 by the now extinct Keynsham Abbey. (William was its founder and patron). Keynsham Abbey was dissolved by Henry VIII in 1539. 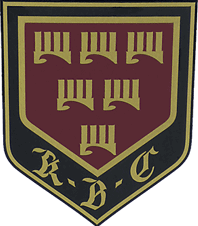 The Clarions/trumpets have persisted and remain as part of the Coat of Arms of Keynsham Town and feature on many of the town's sports club badges; including, of course, that of Keynsham Bowling Club.